16 gauge cable suitable for indoor and outdoor use. Rated to handle 125 Volts power connections at 13 AMPS, 3 prong connectors ensure a solid connection to your existing cable and your wall outlet. Please use with caution and adhere to all usage instructions as listed in the product manual. Do not run cords under doors as the cord might get damaged, cut or torn, which could cause possible electrical shock and fire danger. If you believe the unit is not working properly, please contact our customer service team. Danger: electrical cords can be hazardous misuse can result in fire or death by electrical shock. Please read both sides of the warning card attached to the cable carefully and follow all directions. Before use: inspect thoroughly before each use. do not use if damaged. Look for the number of watt on appliances to be plugged into cord, compare the appliance's watts requirement to the cable's watts capability marked on its label/tag. 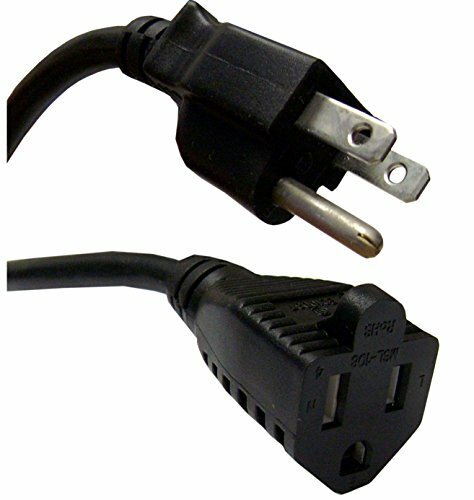 Do not plug appliances or devices that require more than the specified number of watts into this cord. Do not run through doorways, holes in ceilings, walls or floors. Make sure appliance is of before connecting cord to outlet. fully insert plug into outlet. do not remove, bend modify any metal prongs or pins of cords. Do not use excessive force to make connections. Do not connect a three-prong plug to a two-hole cord. this is polarized cord ;( keep away from water, do not use when wet, keep children and pets away from cord). Do not plug one extension cord into another. Avoid overheating. uncoil cord and do not cover it with any material. Do not drive, drag or place objects over cord. Do not walk on cord. After use: grasp plug to remove from outlet. Always store cord indoors. Always unplug when not in use. Do not unplug by pulling on cord. Warning: wash hands after handling. do not remove the warning tag.